This Deccan banded gecko Geckoella dekkanensis, or the Deccan ground gecko as it is also referred to, met its end early one morning on a tiny forest path in the Sanjay Gandhi National Park, Borivli, Mumbai. 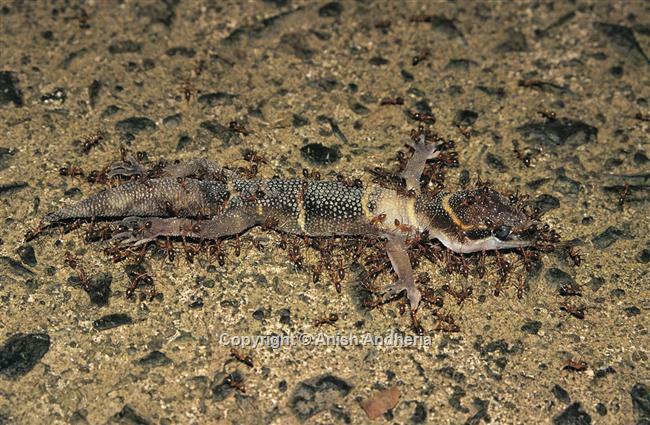 A ground-dwelling reptile, when it was alive the gecko would have fed primarily on insects including the ant-undertakers seen here in this image. A rainy day forest trek in September 1999, revealed a large contingent of tiny amber coloured ants marching purposefully towards something that lay half-hidden in the leaf litter. Careful not to disturb the jungle drama, I moved closer, only to discover that the ants had hit upon a veritable El Dorado. I imagine the gecko must either have been diseased, or had suffered some other unknown fate, because even though these ants have been known to overpower prey larger than themselves, a healthy gecko was out of their league. And since the eyeballs were relatively intact I knew the animal had just died. I had always read about the astonishing strength of ants, but only when I saw an entire gecko being moved like some kind of Gulliver in a land of Lilliputians, did the true power of the plucky creatures come home to me. Perhaps even more fascinating than their brute strength was their sophisticated and subtle communication technology. How did the ants near the nose know precisely what speed and direction to pull at and how was this conveyed to those near the tail? What chemical signals did they use? Would humans too one day learn to communicate using chemical transmitters? While I await answers to such questions, I continue to be awestruck by the unadulterated efficiency with which nature manages itself. The gecko would soon be dismembered leaving no trace of its origins apart from the carbon and other elements that originally went into its making and which would now be converted to good use to make more ants.